The Thermapen IR has a hard ABS case containing 'Biomaster' system which reduces bacterial growth on the thermometer, the Thermapen IR has a motion sensing sleep mode ( probe only) which will turn the instrument on/off when set down or picked up all by it's self which will make the battery very long lasting. Simply point and fire the infrared thermometer at the target to display the surface temperature to scan a wider area press and hold the scan button. 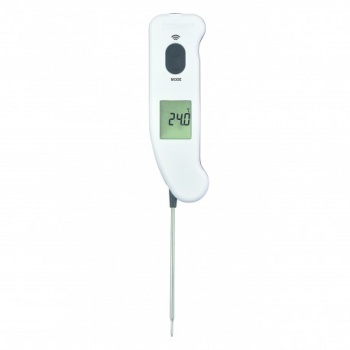 Thermapen IR thermometer has many functions including max/min temperature function using the mode button (IR only). The distance to target ratio is 5:1, therefore the thermometer should be positioned as close to the target as possible. Default emissivity is 0.95 but can be adjusted between 0.1 and 1.0, if required via the mode button. Superb item delivered next day.